Thus I have heard, at one time the Buddha dwelt on Mount Grdhrakuta, near the City of the House of the Kings, together with a gathering of Great Bhikshus, twelve thousand in all. All were Arhats who had exhausted all outflows and had no further afflictions. Having attained self-benefit, they had exhausted the bonds of all existence and their hearts had attained self-mastery. Their names were: Ajnatakaundinya, Mahakashyapa, Uruvilvakashyapa, Gayakashyapa, Nadikashyapa, Shariputra, Great Maudgalyayana, Mahakatyayana, Aniruddha, Kapphina, Gavampati, Revata, Pilindavatsa, Vakkula, Mahakaushthila, Nanda, Sundarananda, Purnamaitreyaniputra, Subhuti, Ananda, and Rahula--and other Great Arhats such as these, whom the assembly knew and recognized. Moreover, there were those with further study and those beyond study, two thousand in all. There was the Bhikshuni Mahaprajapati with her retinue of six thousand, and Rahula’s mother, Bhikshuni Yashodhara, also with her retinue. There were eighty thousand Bodhisattvas, Mahasattvas all irreversibly established in anuttarasamyaksambodhi. All had obtained dharani and the eloquence of delight in speech and turned the irreversible wheel of the Dharma. They had made offerings to limitless hundreds of thousands of Buddhas and in the presence of those Buddhas had planted the roots of myriad virtues. They were constantly receiving those Buddhas’ praise. They cultivated themselves in compassion and were well able to enter the wisdom of the Buddhas. They had penetrated the great wisdom and arrived at the other shore. Their reputations extended throughout limitless world realms, and they were able to cross over countless hundreds of thousands of living beings. Their names were: the Bodhisattva Manjushri, the Bodhisattva Who Contemplates the World‘s Sounds, the Bodhisattva Who Has Attained Great Might, the Bodhisattva Constant Vigor, the Bodhisattva Unresting, the Bodhisattva Jeweled Palm, the Bodhisattva Medicine King, the Bodhisattva Courageous Giving, the Bodhisattva Jeweled Moon, the Bodhisattva Moonlight, the Bodhisattva Full Moon, the Bodhisattva Great Strength, the Bodhisattva Unlimited Strength, the Bodhisattva Who Has Transcended the Three Realms, the Bodhisattva Bhadrapala, the Bodhisattva Maitreya, the Bodhisattva Jewel Accumulation, the Bodhisattva Guiding Master--and other Bodhisattvas, Mahasattvas such as these, eighty thousand in all. At that time, Shakra Devanam Indrah was present with his retinue of twenty thousand gods. Among them were the God Moon, the God Universal Fragrance, the God Jeweled Light, and the Four Great Heavenly Kings with their retinues, ten thousand gods in all. There was the God Comfort, and the God Great Comfort, with their retinues, thirty thousand gods in all. There was the God King Brahma, ruler of the Saha world, as well as the Great Brahma Shikhin and the Great Brahma Brilliance, and others, with their retinues, twelve thousand gods in all. There were eight Dragon Kings: The Dragon King Nanda, the Dragon King Upananda, the Dragon King Sagara, the Dragon King Vasuki, the Dragon King Takshaka, the Dragon King Anavatapta, the Dragon King Manasvin, and the Dragon King Utpalaka, and others, each with his retinue of several hundreds of thousand followers. There were four kinnara kings: the Kinnara King Dharma, the Kinnara King Fine Dharma, the Kinnara King Great Dharma, and the Kinnara King Upholder of Dharma, each with his retinue of several hundreds of thousands of followers. There were four gandharva kings: the Gandharva King Music, the Gandharva King Musical Sound, the Gandharva King Beautiful, and the Gandharva King Beautiful Sound, each with his following of several hundreds of thousands of followers. There were four asura kings: the Asura King Balin, the Asura King Kharaskandha, the Asura King Vemachitrin, and the Asura King Rahu, each with his retinue of several hundreds of thousands of followers. There were four garuda kings: the Garuda King Great Majesty, the Garuda King Great Body, the Garuda King Great Fullness, and the Garuda King As You Will, each with his own retinue of several hundreds of thousands of followers. There was Vaidehi’s son, the King Ajatashatru, with his retinue of several hundreds of thousands of followers. Each made obeisance to the Buddha’s feet, withdrew to one side and sat down. At that time, the World Honored One, having been circumambulated by the fourfold assembly, presented with offerings, honored, venerated, and praised, for the sake of the Bodhisattvas, spoke a Great Vehicle Sutra named The Limitless Principles, a Dharma for instructing Bodhisattvas of which the Buddha is protective and mindful. After the Buddha had spoken this Sutra, he sat in full lotus and entered the samadhi of the station of limitless principles, body and mind unmoving. 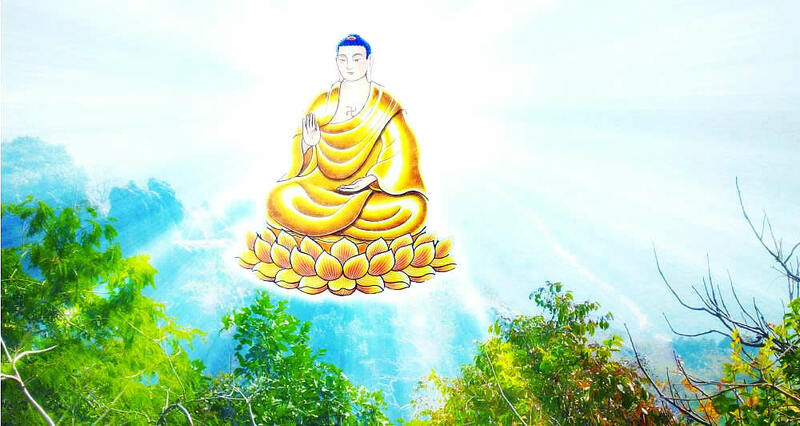 At that time there fell from the heavens a rain of mandarava flowers, mahamandarava flowers, manjushaka flowers, and mahamanjushaka flowers, which were scattered upon the Buddha and the entire great assembly. All the Buddhas universes quaked in six ways. At that time the entire great assembly of Bhikshus, Bhikshunis, Upasakas, Upasikas, gods, dragons, yakshas, gandharvas, asuras, garudas, kinnaras, mahoragas, beings human and non-human, as well as the minor kings, the wheel-turning sage kings, all attained what they had never had before. They rejoiced and joined their palms and, with one heart, gazed upon the Buddha. Then the Buddha emitted from between his brows a white hair-mark light which illumined eighteen thousand worlds to the east, omitting none of them, reaching below to the Avichi hells and above to the Akanishtha Heaven. From this world were seen all the living beings in the six destinies in those lands. Further were seen all the present Buddhas in those lands and all the Sutras and Dharma spoken by the Buddhas was heard. Also seen were the Bhikshus, Bhikshunis, Upasakas, Upasikas in those lands who cultivated and attained the Way. Moreover were seen the Bodhisattvas Mahasattvas, the various causes and conditions, the various beliefs and understandings, and the various appearances of their practice of the Bodhisattva Way. Further were seen the parinirvana of the Buddhas and, after the parinirvana of the Buddhas, the building of stupas with the seven jewels to hold their sharira. delights the hearts of those assembled? trembles in six different ways. they obtain what they had never had. all to become of golden hue. all of this is seen, herein. of foremost subtlety and wonder. numbering in the countless millions. as, within his world, each one proclaims the proper Dharma. which brings all suffering to an end. they speak of enlightening to conditions. they speak of the way of purity. which I shall now explain in brief. jeweled hand drawn carts and palanquins. the one which all the Buddhas praise. seeking for the utmost Way. clothe themselves in Dharma robes. reciting Sutra texts with joy. to ponder on the Buddha Way. and attaining five spiritual penetrations. sing praises of the Dharma kings. accept and hold all they have heard. preach Dharma to the multitudes. and beating on the Dharma drum. they do not find it cause for joy. and leading them to the Buddha Way. with diligence the Buddha Way. with which they seek the Buddha Way. seeking for the Buddha Way. drawing near to those with wisdom. in quest of the Way of the Buddha. make offerings to the Buddha and the Sangha. make offerings to the Sharira. to adorn those realms and lands. two thousand Yojanas in breadth. and jeweled bells which harmoniously chime. they can illumine limitless lands. obtained what we have never had. pray resolve the assembly’s doubts. looks up to you, humane one, and to me. emitted such a brilliant light? resolve our doubts, so we may rejoice. by putting forth this brilliant light? Does he wish, now, to preach it? or is he going to give predictions? does not betoken small conditions. what is it that is to be said?